Scott McLaughlin (DJR Team Penske) converted his pole position at Phillip Island Circuit into his second win of the season in the fourth round of the 2018 Virgin Australia Supercars Championship. For the driver of the #17 Ford FG X Falcon, it’s his 18th Supercars victory in a career. 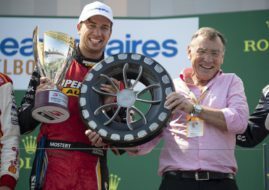 His victory is the best way to celebrate DJR Team Penske’s 100th Supercars start since the formation of the new team in 2015. For most of the race, McLaughlin was watching into the rear end of Jamie Whincup‘s #1 Holden ZB Commodore. Whincup was sharing the front row on the grid with McLaughlin, stealing the lead at the start and staying in front until lap 41 (of 57). He defended a lead over two pit stops but didn’t manage to defend McLaughlin’s attack on lap 41. Afte 57 laps, McLaughlin crossed the finish line with 0.8960sec advantage. Rick Kelly clinched the third place in the #15 Nissan Altima in his 500th Supercars start. The 2006 series champion made his Supercars debut in 2001, scoring 12 wins and 55 podiums since then. Two DJR Team Penske’s Ford occupied the front row after qualifying but Fabian Coulthard was penalized because of technical infringement and thrown back to P26. He made a fantastic progress through the race, finishing in the 13th place. Triple Eight’s Holdens of Shane van Gisbergen and Craig Lowndes finished in the fourth and fifth place respectively. Chaz Mostert brings his #55 Ford to the sixth place, ahead of Erebus Motorsport’s David Reynolds in the #9 Holden and his teammate Anton de Pasquale in the #99 Holden. Will Davison (23Red Racing Ford) and Scott Pye (Walkinshaw Andretti United Holden) completed the top 10. One more 57-lap race at Phillip Island is scheduled for tomorrow.